Black and Hispanic children with asthma are less likely to use daily, long-term asthma control medications than White children. The differences in medication use between Black and White children are largely unexplained but may be due to variation in prescribing practices of physicians. 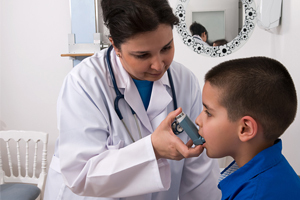 Black and Hispanic children with asthma are less likely than White children to use long-term asthma control medications, finds a new study in Health Services Research. Reliever medications are quick-acting drugs used to manage acute symptoms of asthma. The National Asthma Education and Prevention Program recommends that long-term controller medications—medications taken daily to reduce airway inflammation and prevent onset of asthma symptoms—should be used to achieve and maintain control of persistent asthma. Sarpong and Edward Miller, Ph.D., researchers at the federal Agency for Health Research and Quality, wanted to research the contributing factors for this disparity in medication use. The study used nationally representative data from the 2005-2008 Medical Expenditure Panel Survey, the 2000 Decennial Census, and the 2004-2007 National Health Interview Survey and included data on both privately and publicly insured children. Living in the western United States and having non-native parents was linked with the majority of the difference in medication use between Hispanic and White children. Lower family income and a lower likelihood of having parents who are married was also associated with the difference in controller use for both Black and Hispanic children. However, much of the difference in controller use by Black children compared to White children was largely unexplained. This finding was observed even when taking insurance status into account. “This may point to biases in the health system, maybe in prescribing patterns, or in the quality of care,” Sarpong says. Glenn Flores, M.D., professor of pediatrics at the University of Texas Southwestern in Dallas, considers healthcare provider and healthcare system bias to be a prominent factor in sub-optimal asthma care. “Too often we’re blaming the kids or the families when, in fact, it may be we as healthcare providers or the healthcare system that’s responsible for not just this racial and ethnic disparity, but many racial and ethnic disparities,” he says. Flores also considers inadequate patient and family education, healthcare provider failure to schedule follow-up care, and failure to provide prescriptions for medication refills to be key areas for improvement. He also emphasizes the importance of access to specialty care, which has been shown to improve outcomes in asthma. “We and others have shown that minority kids in general—no matter what condition you’re looking at—have lower access to specialty care,” he says. Sarpong E and Miller GE. Racial and ethnic differences in childhood asthma treatment in the United States. Health Services Research. (2013). Prepared Patient: Chronic Conditions: When Do You Call the Doctor?